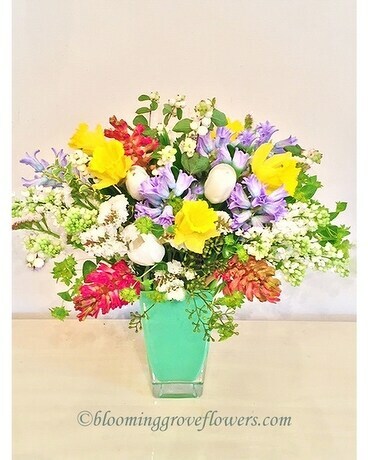 Seasonal designer choice arrangement suitable for many occasions: white lilac, yellow daffodils, 'raspberry' hyacinth, lavender hyacinth, white tulips, snowberry, white statice, bupleurum, seasonal fillers and greenery in a matching vase. Flowers and Containers subject to change based on season and availability. However we will create something similar using products with an equivalent or higher value: we will find substitution to assure the best quality and presentation for your special gift.